Below is a list of general templates for our presses. Download the desired size to serve as a visual guide for your print job. Included in the download file is a *.jpg file set to the size of the document to be printed. The graphic for the flyer should cover the entire template. The edges in red define the safe inner area for printing. Anything outside the white area is subject to be being cropped. All *.jpg files are 300 DPI/CMYK settings. Note: Do not submit sample templates with red border or with red graphic in center. Please do not convert the red border to a white border or else files will print with a white border. 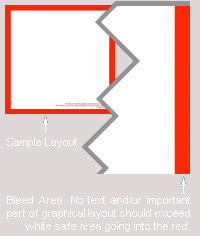 Red border is only used as a safety precaution so that your letters will not get cut. If you´re not familiar with a graphic editor you may secure design services from PGExpress to design and create your flyers for you. BUSINESS CARDS AND SPECIALTY JOBS SUCH AS SCORE AND FOLD, DIE-CUTS,PERFORATIONS, ETC. ALL REQUIRE BLEEDS. IF A JOB IS NOT SUBMITTED WITH A BLEED, YOUR JOB YOUR JOB MIGHT NOT BE 100% ACCURATE WHEN IT FOLDS. pgexpressinc.com prints gang run jobs unless otherwise stated. Color Critical jobs must be submitted clearly noted as Color Critical, and must be accompanied by a request for Color Proof or MatchPrint. Color Proofs are not included in our base cost schedule and will incur an additional charge. Printing prices for a dedicated press run will also vary from those advertised on this website. Please take special care to clearly indicate a job as Color Critical so that special attention can be given to that job. PGE will not be liable for color variations which are common when printing gang runs unless a JOB is clearly identified as Color Criticial from the onset. I UNDERSTAND THAT SLIGHT COLOR VARIATIONS WILL OCCUR. I understand that if my job is color critical, I must purchase a Matchprint© or other color proof to guarantee precise color and that the use of a Matchprint© will delay my job a minimum of 72 hours. I have read the job specs and prepared my file according to the guidelines specified.